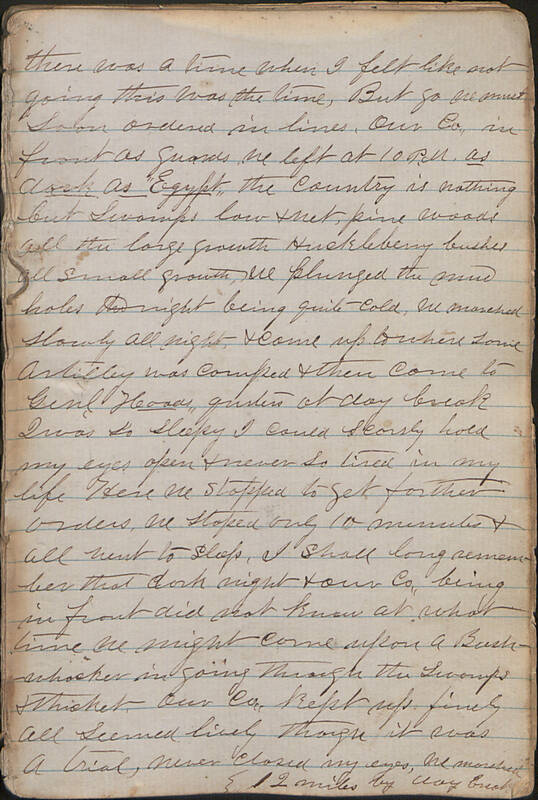 Item Description: Diary entry, 13 April 1863, written by Thomas Lewis Ware, presumably of Washington, Ga., while he was a member of the 15th Georgia Infantry Regiment, Confederate States of America, serving in Virginia and in the Gettysburg campaign, during which he was killed. 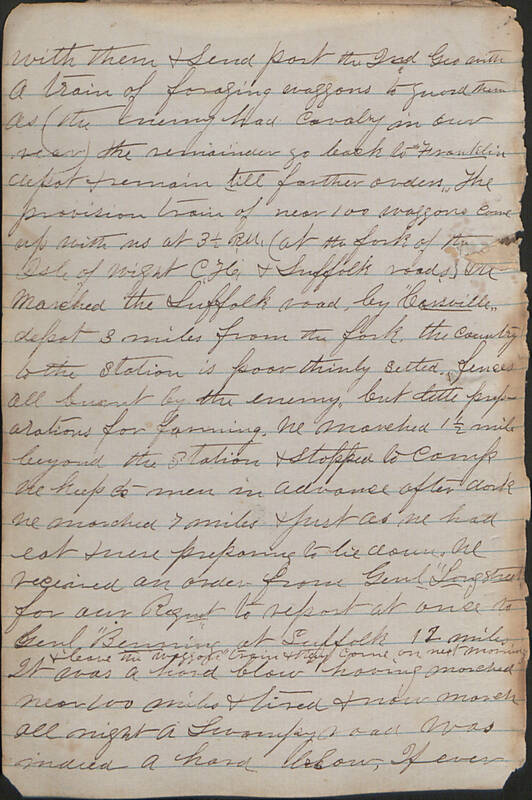 The diary consists of daily entries for the period 21 July 1861-2 July 1863. Entries are often detailed descriptions of military activity or observations on towns, countryside, and civilians. 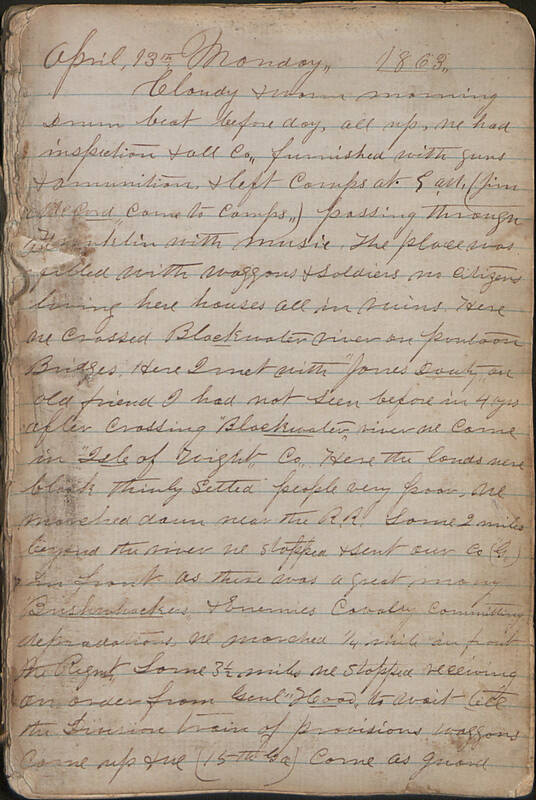 The final pages of the diary, which concludes on the day that Ware died, are written in a different hand, and reflect on his death. Item Citation: From volume 5 of the Thomas Ware Diary #1796-z, Southern Historical Collection, The Wilson Library, University of North Carolina at Chapel Hill. Cloudy & warm morning. Drum beat before day, all up. We had inspection & all “Co” furnished with guns & ammunition, & left Camps at 9 A.M. (Jim “McCord” came to Camps) passing through Franklin with music. The place was filled with waggons & solders, no citizens living here, houses all in ruins. Here we crossed Blackwater river on Pontoon Bridges. Here I met with “Jones Douty” an old friend I had not seen before in 4 yrs. After crossing “Blackwater” river we cam in “Isle of Wight” Co. Here the lands were black, thinly setled, people very poor. We marched down near the R.R. some 2 miles beyond the river we stopped & sent our Co (“G”) in front, as there was a great many “Bushwackers” & Enemies Cavalry committing depredations. We marched 1/4 mile in front the Reg’mt. Some 3 1/2 miles we stopped, receiving an order from Gen’l “Hood” to wait ’till the Division train of provisions waggons came up & we (15th Ga) come as guard with them & send part the 2nd Geo with a train of foraging waggons to guard them as (the enemy had Cavalry in our rear) the remainder go back to “Franklin” depot & remain ’till further orders. The provision train of near 100 waggons came up with us at 3 1/2 P.M. (at the fork of the Isle of Wight C. H. & Suffolk roads. We marched the Suffolk road by “Carsville” depot 3 miles from the fork. The country to the Station is poor, thinly setled, fences all burnt by the enemy, but little preparations for farming. We marched 1 1/2 miles beyond the Station & stopped to Camp, we keep 5 men in advance. After dark we marched 7 miles & just s we had eat & were preparing to lie down, we received an order from Gen’l “Longstreet” for our Reg’mt to report at once to Gen’l “Benning” at Suffolk, & leave the waggon train & they come on next morning. It was a hard blow, having marched near 100 miles & tired & now march all night a swampy road was indeed a hard blow. If ever there was a time when I felt like not going this was the time, But go we must. Soon ordered in lines. Our Co in front as guards. We left at 10 P.M. as dark as “Egypt” the Country is nothing but Swamps, low & wet, pine woods all the large growth, Huckleberry bushes, all small growth. We plunged the mud holes, the night being quite old. We marched slowly all night, & came up to where some Artillery was camped & then came to Gen’l “Hood’s” quarters at day break. I was so sleepy I could scarsly hold my eyes open & never so tired in my life. Here we stopped to get farther orders, we stopped only 10 minutes & all went to sleep. I shall long remember that dark night & our “Co” being in front did not know at what time we might come upon a Bushwacker in going through the swamps & thicket. Our “Co” kept up finely, all seemed lively though it was a trial, never closed my eyes. We marched 12 miles by day break. This entry was posted in Southern Historical Collection and tagged Confederate Army, environment, marching, swamps, thomas ware, wagon trains. Bookmark the permalink.